Here you will find our selection of Aqua Colorful Desktop Supplies. Your study supplies should be as fun and look as great as the rest of your college dorm room, and these dorm essentials make sure your most basic dorm supplies look as great and fun as your college posters or dorm bedding. 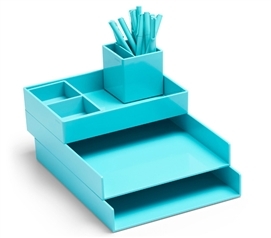 Here you will find everything you need to keep your dorm desk tidy and looking great. From pen cups to staplers and even accessory trays, you can keep your college dorm desk well organized so you can spend more time studying than hunting for a pen or sticky note. Part of succeeding in college involves keeping your dorm desk well organized. You'll have everything you need to work on your homework at your fingertips and you'll even have your homework better organized. 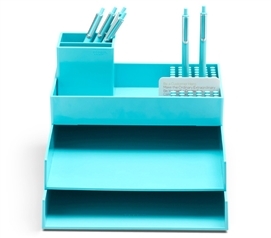 Here you will find our selection of bright aqua desktop supplies that will add to your dorm room decor while keeping your dorm desk organized From pen cups and pens to accessory trays so you can create an in and out box for your homework, you'll find what you need to make studying and working on homework more efficient.